Herbal tea making is just as much of an art as it is a science. 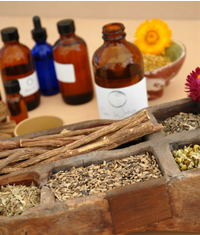 Herbal infusions provide the best way to get acquainted with a new herb. You take note of the texture and color of the leaves and flowers as you measure and breathe in the aroma as the herb is unfurling in the hot water. As you relax with your cup of tea, color, taste, aroma all will signal when an herbal brew is "just right" for you. 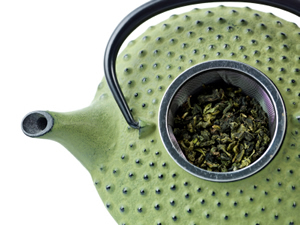 Tools : You don't need anything fancy, the most important tea tool is a non-aluminum pot with a tight fitting lid. Add a strainer and a tea cup and you are good to go. Average Dose: The average dosage is usually 3 to 4 cups in a day. Bitter medicines need only be taken in small doses, usually 1/2 cup at a time. Variations : Spices like ginger, cinnamon, cardamom, cloves, and allspice add heat and energy to the infusion. Almond and vanilla extracts, raw honey, fresh lemon, or a pinch of stevia add flavor and zest. Standard Brew. Ratio : Two cups water to one ounce dried herb. This equals 1 to 2 tablespoons of dried leaves or flowers. To brew a single cup use 1 teaspoon per cup of water. When infusing fresh herbs use 2 to 3 times the amount of dried. Depending on the herb you will generally use hot to boiling water. Pour hot water over herb in a closed container and leave to steep. Brewing time: 5 to 20 minutes. Infusing herbal tea is unlike brewing "tea", Camellia sinensis, which becomes bitter and undrinkable if left to infuse too long. Most herbal teas benefit from a longer steeping time, the better to extract the medicinal properties. Brewing the herbs in a closed container like an enamel teapot prevents and volatile compounds such as essential oils from escaping. Strain: Or not. I often just let the herbs settle to the bottom and pour off the top, letting the herbs soak in the water. The second cup is often better than the first. With practice you will get a feeling for how strong you like your drink. You need not throw out the leftovers either, and may want to reuse them as a "starter" for another fresh batch. Storage: Refrigerate any unused portions in a clean glass jar with a lid. Herbal teas are often better the second day but should not be kept longer than 3 days as a general rule. Cold infusions: Sun and Moon Tea. Put fresh or dried herbs in a glass jar filled with water and place in a hot, sunny windowsill for several hours. A Moon tea is made by placing the herb in an open crystal glass or bowl. Cover the herb with fresh water and place directly in the moon light, a full moon being the best time. Do not cover. Allow to infuse overnight and drink first thing in the morning. These infusions will be subtle, and work best with fresh, aromatic herbs like chamomile, and mints.